Yesterday's storms may have contributed to the death of a construction worker on the Olympic site. A crane operator, said to be in his 60s, was found dead at the base of his crane stairwell at 2.30pm yesterday. According to Metro, his death coincided with the torrential rain. An eyewitness told the paper 'He got out of his cab and was going down the crane ladder when he slipped and fell about 9m'. An inquest will now look into whether equipment failure or a medical condition contributed to the accident. The man's death, in the Olympic Village, is the first on the construction site. A spokeswoman for the Olympic Delivery Authority commented: "The sympathies of everyone at the ODA and its contractors are with this individual's family and friends at this very difficult time." It's not yet been confirmed whether yesterday's fire in a Bermondsey tower block was caused by a lightning strike. The Daily Mail seems in no doubt, however, attributing the blaze to a 'bolt of lightning'. Meanwhile, Gatwick control tower was hit by lightning, causing delays and cancellations. Transport woes also hit rail lines out of Paddington following strikes of a non-union kind to overhead power cables. 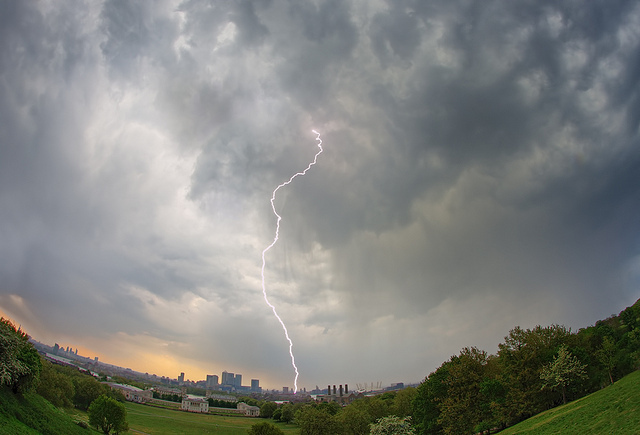 A teaching assistant in Sutton was also hit by lightning, but survived unhurt. Image of a previous storm by Londonietis in the Londonist Flickr pool.